Detroit Lions head coach Jim Caldwell says that re-signing All-Pro defensive end Ndamukong Suh will be a top priority of the team in the offseason. If the Lions apply the franchise tag on Suh for next season, it will cost the team $26.7 in salary, with $9.7 million of dead money on their salary cap. Suh, 28, is expected to hit the free agent market in March. 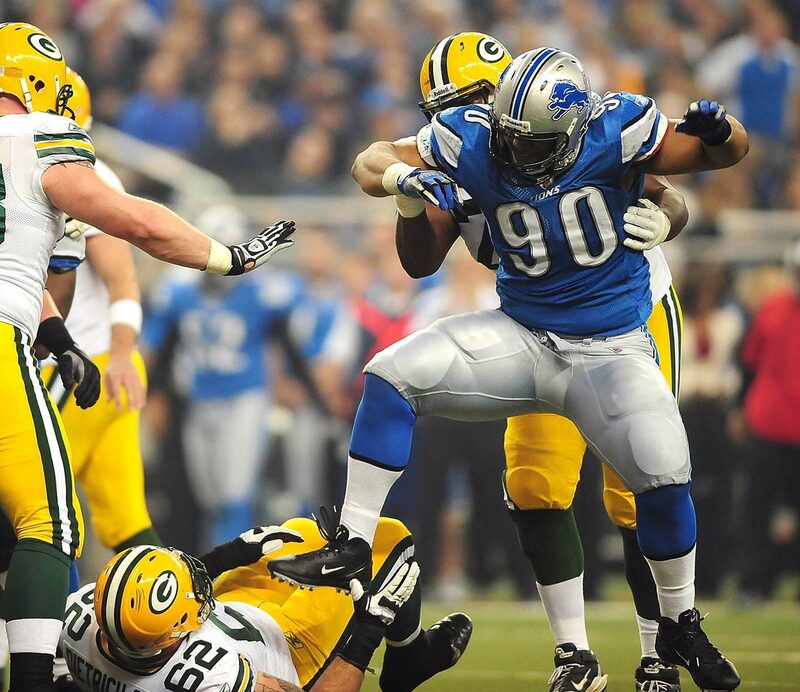 Before he even played his first official snap, Suh announced himself as a ferocious, if not dirty player. In an exhibition game against the Cleveland Browns in August 2010, Suh charged through the defensive line and yanked quarterback Jake Delhomme's facemask before tightening his grip and throwing Delhomme down by his head. Suh was fined $7,500 for the hit. Suh has a history with Bears QB Jay Cutler, starting with a nasty forearm shove, during a game in December 2010, that was deemed a blow to the head and cost the defensive tackle $15,000. Replays later showed that Suh actually hit Cutler above the shoulder pads and below the neck, but the hit was still deemed a fineable offense. 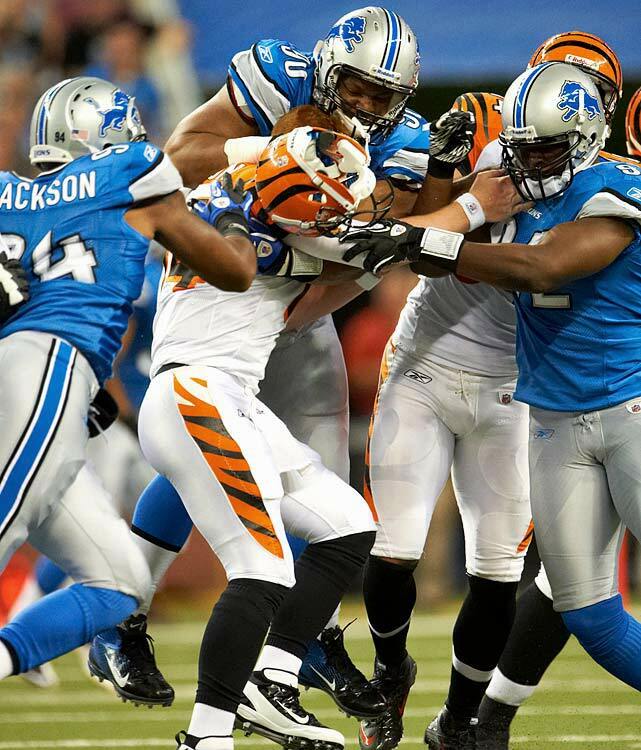 Bengals QB Andy Dalton received a rude and highly illegal welcome to the NFL by Suh when the then-rookie had his helmet ripped off in the 2011 preseason opener. The hit, similar to the one Suh put on Delhomme, earned him a $20,000 fine. Suh was none too happy about the response as he would tweet: "$20,000REALLY???!!" 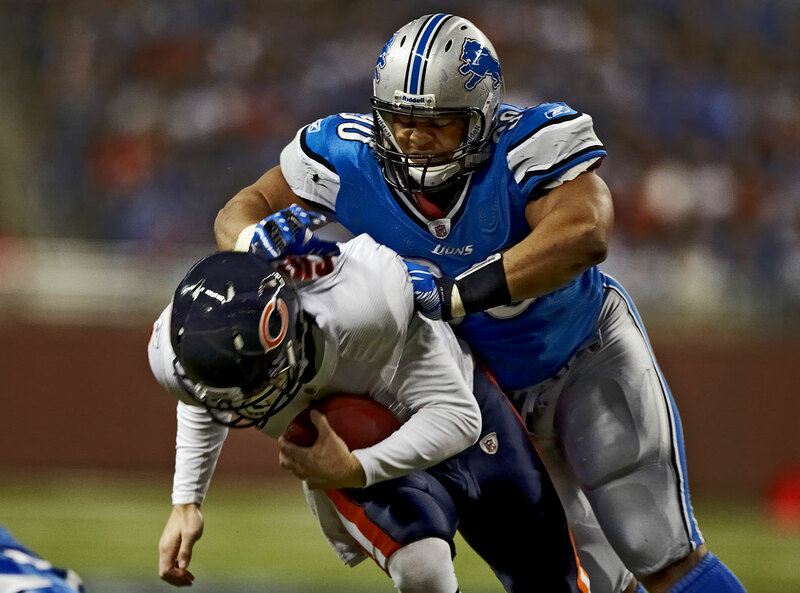 Suh was voted the dirtiest player in a Sporting News poll of 111 players on 31 teams. Suh won in a landslide over the Steelers' James Harrison. 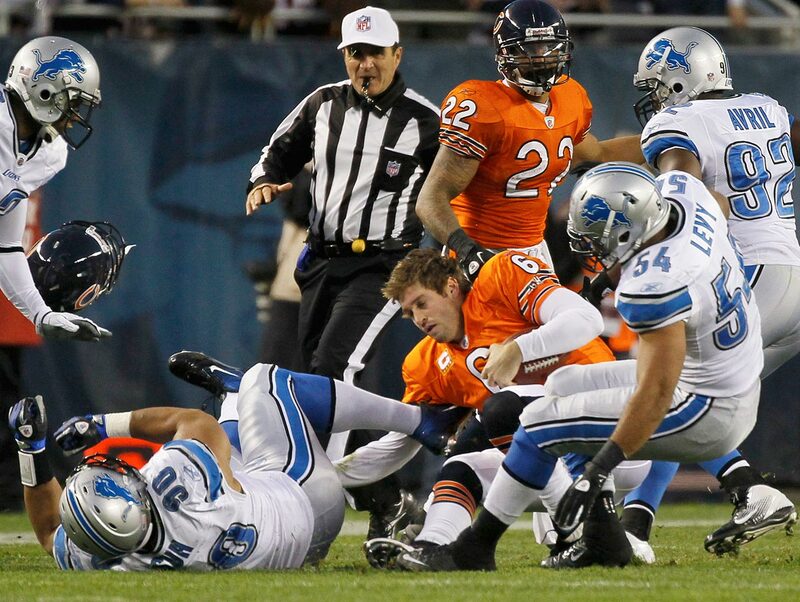 In a November 2011 game, Suh ripped Cutler's helmet off while taking the quarterback down. In a Thanksgiving game against the Green Bay Packers in 2011, Suh became tangled up with Packers guard Evan Dietrich-Smith and eventually stamped the lineman after standing up. The act earned Suh a two-game suspension without pay and sullied his reputation in the press and throughout the league. 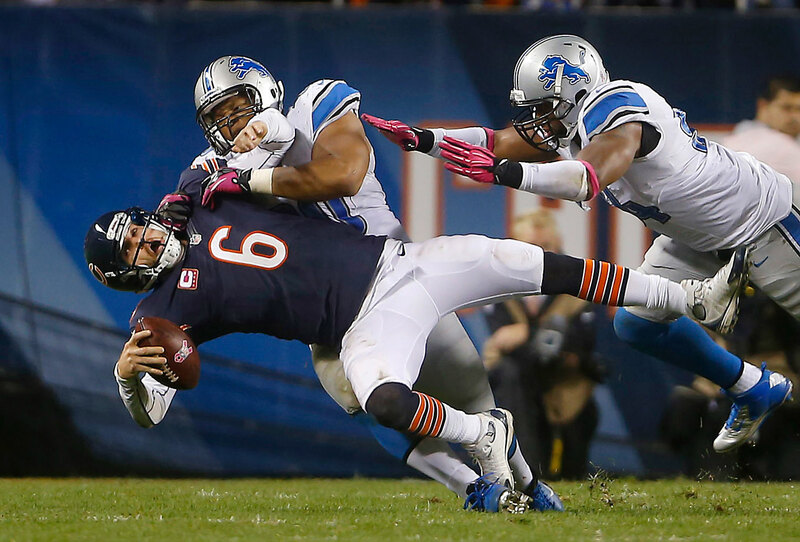 In an October 2012 game against the Chicago Bears, Suh laid a controversial but decidedly legal hit on quarterback Jay Cutler, a player that he has terrorized in the past. Suh chased Cutler to the sidelines before grabbing his shoulder pad and violently driving the quarterback into the ground. The NFL determined not to fine Suh for the hit. 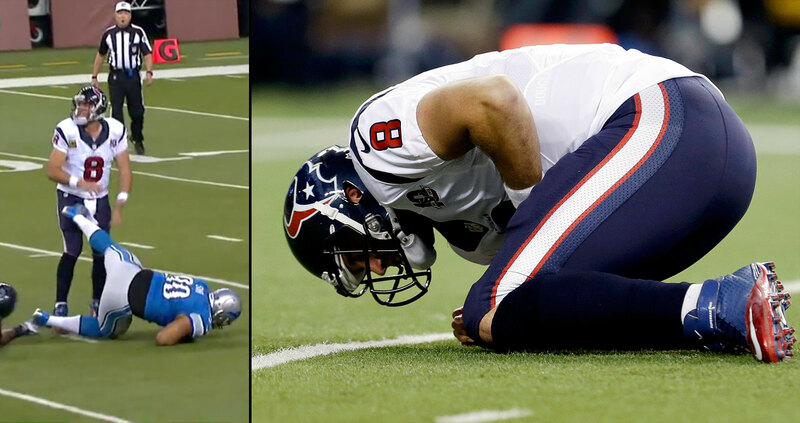 Suh was fined $30,000 for kicking Houston quarterback Matt Schaub during a Thanksgiving Day game on Nov. 22, 2012. 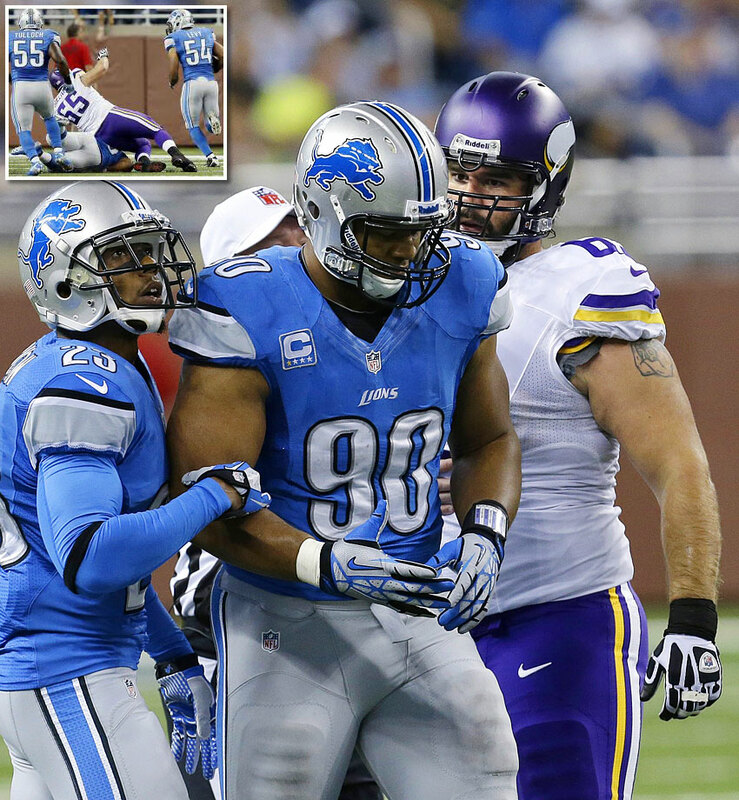 After Suh was taken to the ground, his foot swung toward Schaub and hit him in the groin area. During the 2013 season opener, with 14:09 left in the second quarter, Vikings quarterback Christian Ponder threw a pick to Detroit outside linebacker DeAndre Levy, who appeared to take it to the house for a touchdown. However, Ndamukong Suh negated the score when he put a clearly illegal block on Minnesota center John Sullivan. 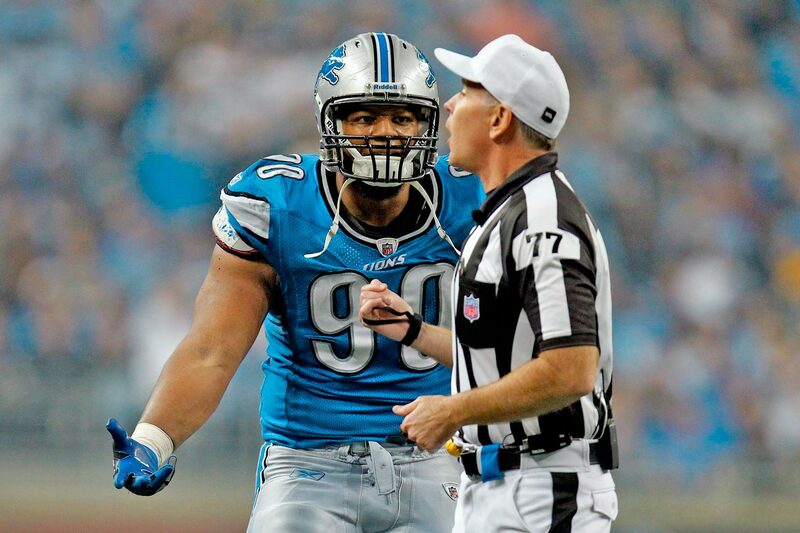 The NFL levied a $100,000 fine against Suh for the low block. 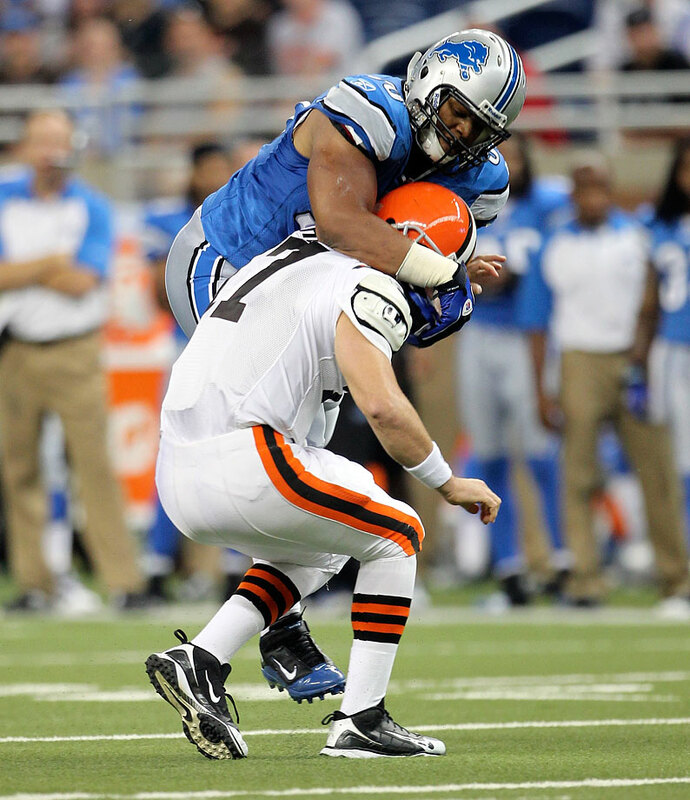 Suh was fined $31,500 for a hit on Cleveland quarterback Brandon Weeden in Week 6 of the 2013 season. Suh's hit did not draw a penalty during the game, and it appeared that he actually let up a bit on Weeden. 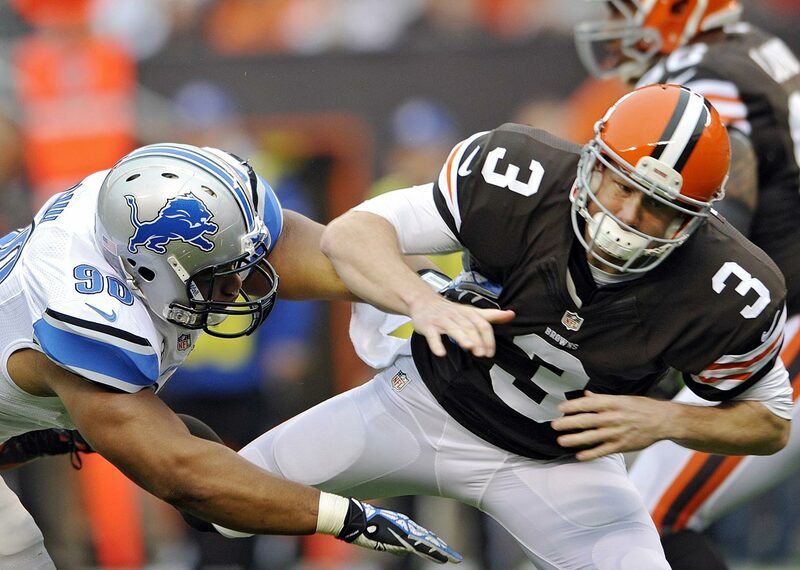 Suh and Weeden also had another run-in during the Lions' win. On a Weeden scramble in the third quarter, Suh grabbed him and tossed him to the ground with authority. There was no penalty called there either (and probably not one warranted). 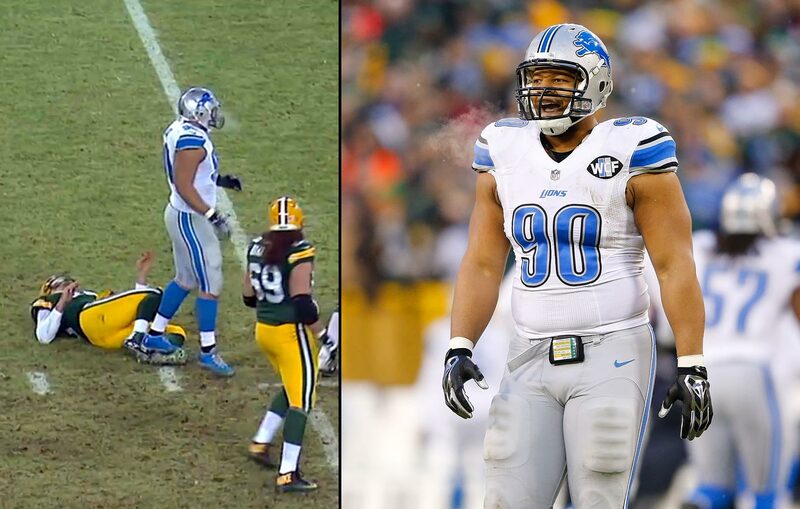 Regardless of which play was in question, there's little question that Suh's reputation came into play here. Suh was suspended for one game (an NFC Wild Card game) for stepping on Aaron Rodgers' leg during the fourth quarter of a 30-20 Packers victory in their last game of the 2014 season, which clinched the NFC North for Green Bay. Suh was not flagged on the play. Rodgers had injured the leg earlier in the game while throwing a short touchdown pass to receiver Randall Cobb. In the NFL's official ruling on the suspension, Rodgers was described as "in a defensless posture." After Suh backed up and stepped on Rodgers' leg, Suh did so again with his other foot, "applying pressure and unnecessarily pushing off Rodgers’ unprotected leg with his left foot, violating playing rules prohibiting unnecessary roughness. Suh signed a six-year, $114 million contract with the Dolphins prior to the 2015 season. His acquisition was expected to vastly improve the Dolphins defense, but through Week 2 he has made minimal impact (two tackles and one assist with no sacks). Suh reportedly disregarded play calls from defensive coordinator Kevin Coyle in the team’s Week 2 loss to the Jaguars. 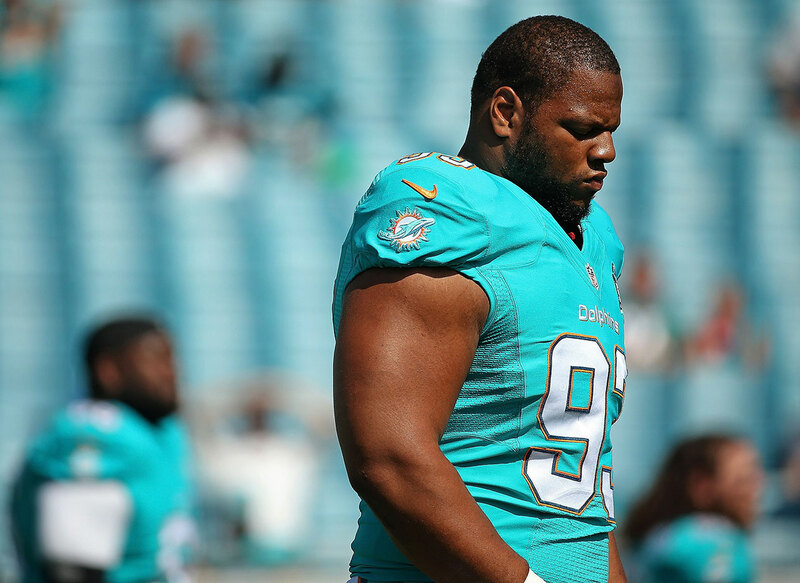 By “freelancing” at times, Suh created confusion on the Dolphins defensive line. "That will continue to be one of our highest priorities," Caldwell said. "That's going to be addressed constantly here until we come to some conclusion." Suh had 53 total tackles and 8.5 sacks for Detroit, who had the league’s best run defense this season. Suh earned his fourth Pro Bowl selection this season. He also was named first-team All-Pro for the fourth time in his career. 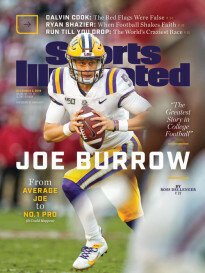 "There's no question about it," Caldwell said. "He's a dominant, dominant player who we benefit greatly from having his services. 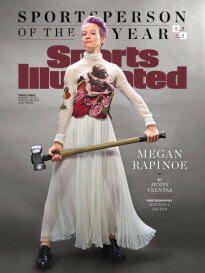 He's a tremendous asset to our team, and I'll leave it at that." In his five seasons, Suh, who was the No. 2 overall pick in the 2010 NFL Draft, has 36 sacks but also has been fined more than $200,000 for various player-safety violations.